For this post, I am going to switch gears a little bit. I am going to talk about other types of surfing that I have yet to really mention. All of the surfing I have been talking about so far has been variations of short board surfing. I have not talked about long boarding or big wave surfing. Both of these subsets of surfing still involve riding waves; the only things that differ are the size and type of the waves, the size and type of the board, and the mentalities that surround that type of surfing. In this post, I will specifically be talking about big wave surfing. Lets take a step back for a moment. Imagine a wave taller than Simmons and Atherton Halls stacked on top of one another. They exist. (For anyone who does not know what those are, Atherton is four floors and Simmons is five floors tall, giving us a total height of about ninety feet). Now imagine surfing a wave that height. The only thing between you and a mountain of water is a ten-foot piece of fiberglass. On some occasions, you may wear a life jacket. It may sound crazy, but there is a group of professional surfers who travel the world looking for this thrill. At a moments notice, they will hop on a plane and travel halfway across the world to surf massive waves. In fact, there is even a professional surfing league aimed at only big wave surfing events. Instead of having ten events though, they have four, all which have close to a three-month long waiting period. From year to year, some of these events are not even held because the conditions are not good enough. That is why they have a three-month waiting period instead of a two-week long waiting period. The contest organizers want the best talent to be displayed in the best conditions so they wait entire seasons to try and get the best waves. 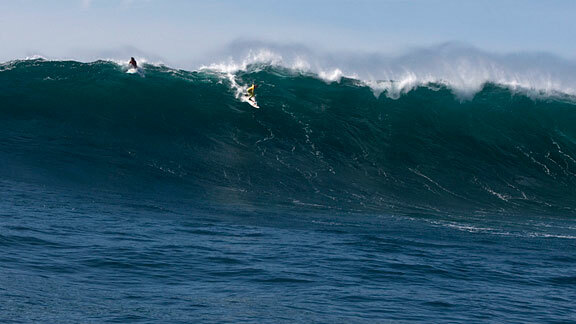 There are two different types of big wave surfing, tow in surfing and paddle surfing. Paddle surfing follows the traditional way of surfing, just instead of a four-foot wave pushing you; a 60-foot wave is pushing you. You paddle as fast as you can and catch the wave as it breaks. 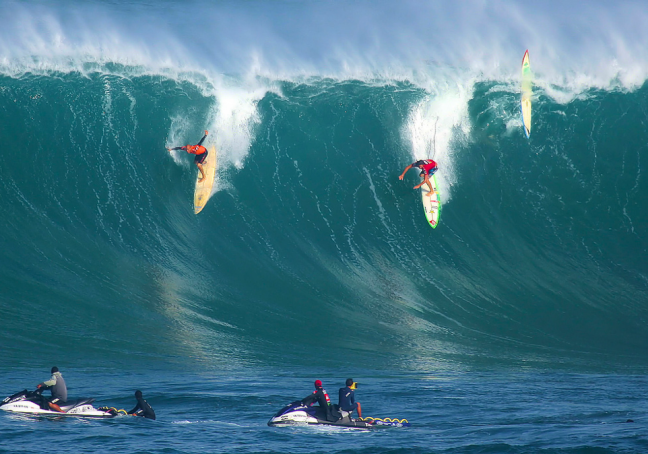 Here is an example of paddle in surfing at Jaws, a surf spot on Maui in Hawaii. In tow in surfing, you are dragged around the ocean like a wake boarder (except you are on a surfboard) until a wave appears. Then you are pulled into the wave at the same speed as the wave and ride it until it breaks. This method allows you to catch waves that are too fast or too large to catch by normal paddle surfing. This method is what allowed tow in surfer, Garret McNamara, to catch an estimated 100-foot wave off of the coast of Portugal last year. Here is an interesting video about Tow Surfing and its creator, Laird Hamilton. The equipment used for big wave surfing is similar to that used in short board surfing, its all just bigger. The boards are designed to be quick so both ends come to sharp point. The fin set-ups are the same. The boards themselves are significantly larger though. They average from nine to ten feet long. Some surfers wear life jackets to help prevent them from drowning, whereas others do not. There is actually a collection of surfers who are trying to design a life jacket that can inflate if the surfer gets trapped under water to help prevent the loss of life. This movement was spurred after the loss of Hawaiian surfer Sion Milosky. 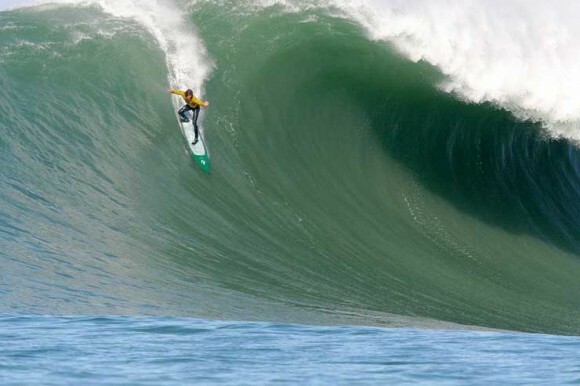 Big wave surfing is not like other forms of surfing. There are very few tricks to be made. The main goal is to make it down the wave successfully without falling. There is no attempt to try and get barreled or to make a turn. You surf big waves for the exhilaration of it. It is very similar to snowboarding down a mountain, just this mountain is moving and could kill you at any second. I hope this post helped you understand a different type of surfing. Next week I will be looking at long boarding. This entry was posted in Passion and tagged haley, passion, rcl1314. Bookmark the permalink. Nice to see different surfing styles! I like how you talk about the technicalities of big wave surfing from start to finish, which explains a lot to a non-surfer like me. 🙂 I also liked the life jacket note; I would be really interested in knowing more about is how surfing is ranked amongst other sports in terms of safety. For example, I heard a while back cheerleading was — I don’t want to use the superlative ‘most’, but — very dangerous. That fact surprised me; so it would be intriguing to see how surfing ranks as well! I also think it’s an interesting situation where the contests are geared more towards the best conditions, whereas in a previous post you wrote how contest surfing was very commercialized. The attitudes in different types of surfing are varied. I didn’t realize that surfing had so many different ‘genres’ so it’s very cool to see the mentalities surrounding such differences. Great post! How dangerous is it to big wave surf? It is something that is both thrilling and terrifying to think about. I like how you included both videos of people surfing, to not only show the different styles you are explaining, but also to provide another source of entertainment. Also, how you included a video about tow surfing and the creator, it really helps enhance your argument. Contest Surfing: Yay or Nay?